The much-loved noodle joint opens its second outpost in the CBD. Tucked away on Victoria Street is the second outpost of much-loved noodle joint The Ramen Shop. Just like the original Newtown version from local hospitality maestros Tsubasa Takahashi and Asher Boote, it's the place to be if you feel like a warm, comforting and delicious meal. A traditional Japanese restaurant serving some of the best ramen in town at a very reasonable price, makes this spot a must try. Perfect for a date night or outing with a couple of friends, though perhaps not suited to larger groups of people. On arrival, the friendly staff will help you out with a seat. The new outpost features classic Japanese counter seating so you can watch the kitchen steam ahead as you slurp. If it is full, takeaways do not take long. 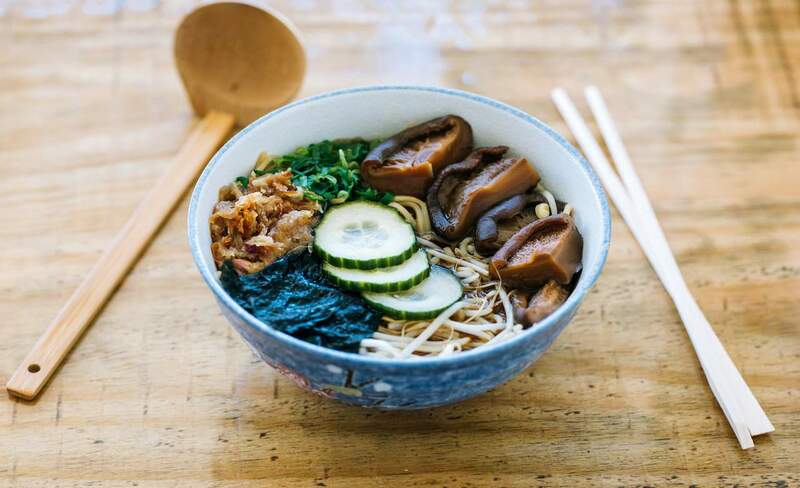 Ramen (for those who are yet to discover this bowl of goodness) is a Japanese-Chinese hybrid dish, with a vegetable or meat broth, fresh noodles, and a variety of toppings — whether it be tender char sui pork, bean sprouts, corn or an egg. You can order it mild or spicy, but either way it's going to fill and warm an empty stomach. As the name suggests, ramen is the specialty dish at The Ramen Shop, but there are a selection of side dishes for those that would like to try a variety — steamed buns, fresh veg with wasabi mayo and pickles. With a big appetite and advice that the side dishes are a must try, I went all out. The chicken karaage spicy mayo steamed bun came out first. Fried chicken is delicious however it comes served, but in a steamed bun it's a game changer. The spicy mayo really topped off the whole bun. Next out was the greatly anticipated char sui ramen ($17). The chicken-based broth was perfectly flavoured (not too salty), the noodles were fresh to the bite, the only let down was the small serving of pork. It was a good amount, but when you love melt-in-your-mouth char sui, more is better. Topped with spring onion and nori, the texture and flavor of this dish was perfect. The serving was size is very generous, you could just get a ramen bowl and leave satisfied. The Ramen Shop is an authentic friendly spot. It really satisfies any winter warmer/rainy day needs. This recently opened restaurant in the CBD is a must visit.